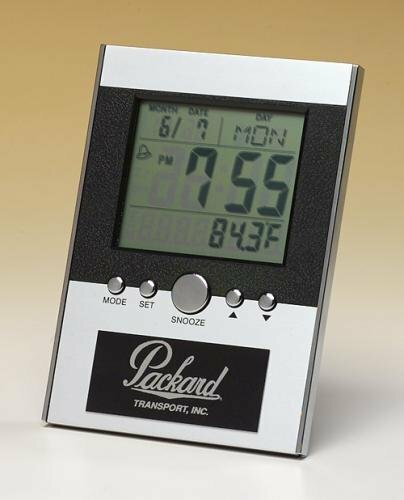 Features day and date calendar, musical alarm digital thermometer and world time capabilities. Lifetime guaranteed movement. Laser engravable aluminum plate. Individually boxed. Batteries Included. Jade Glass Nameplate with Aluminum Holder 3/8" thick. Aluminum holder attached on the base. Cardboard gift box included. Corporate Gifts Pen Set Optical Crystal Single Pen. Funnel Attached. Pen sold separately. Foamed Gift Box included. Turquoise thunderbolts of colored Art Glass award accented with a cluster of stars and a black cast stone base. Paper Weight Acrylic is available in two sizes. These acrylic awards are a great solution for fulfilling all corporate award needs. 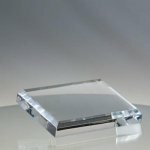 This clear 4" Heart Paper Weight award is a great gift to a loved one on valentines day. Personalize this heart paper weight with the message of your choice.